Kool Kone was stop number 15 on the National Hot Dog Month Tour. I chose Kool Kone because it was a muggy, hot day and the whole gang was at the beach. I wanted to be back to the beach as fast as possible and Kool Kone was the closest place. I have never had a hot dog at Kool Kone, so it was an eligible establishment! 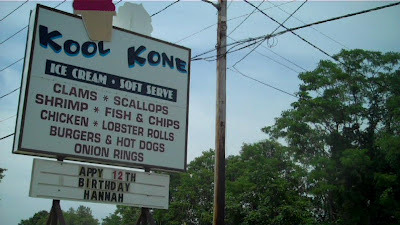 Kool Kone is a classic summer shack/drive-in type of place. They serve up all kinds of ice cream, fried seafood, and, of course, hot dogs. Drew isn't with me on weekends, so there won't be the usual pile 'o pictures on the Hot Dog Stories Facebook Page.